Sigh. Sometimes I have to wonder what the heck is going on over at Infinity Ward and other developers that make a decision like this. 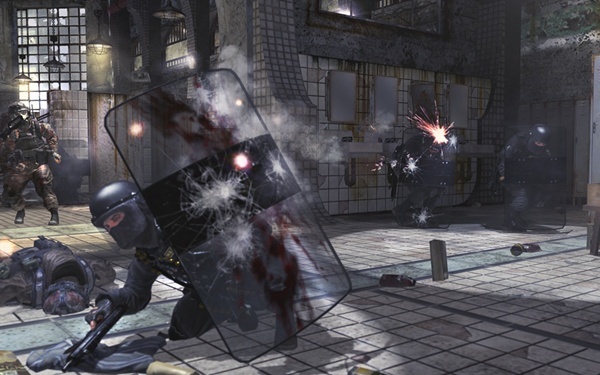 According to the Telegraph review of Modern Warfare 2, the game's only cooperative mode Special Ops, is only playable after completing the game's single player campaign. Update: Please see the update below, it looks like the Guardian review was wrong. Co-Op is available without completing the single player game first. "Spec Ops is a major portion of the game and is available from the start," Robert Bowling, Infinity Ward community manager told us, "It asks you if you want to play Spec Ops when you beat the game." This is where it seems the confusion may have happened. At least it sounds like Spec-Ops will be worth the wait. The game's new mode is Special Ops which can be played solo or in co-op, both local and online. It's unlocked by completing the campaign mode, and is essentially a series of mini-missions; their design is similar to the epilogue mission in COD4's campaign mode, "Mile High Club". They're divided into four groups – Alpha, Bravo, Charlie and Delta – and are based on sections within the campaign's levels. They include scenarios such as defending a raised platform in a snow-covered shipyard, racing snowmobiles across tundra and taking out guerrillas in a favela in Rio de Janeiro while avoiding civilian casualties. A couple of fan-favourites from COD4 are also included, such as the chilling Death From Above mission in AC-10 Spectre Gunship. Special Ops range from one to three stars in their level of difficulty, and players can use the stars they earn to unlock more challenges. There are 23 missions in all, and a lot of them are highly addictive; the temptation to better one's time in the snowmobile race is particularly compelling. This is good news for our co-op night this Thursday! It's not all roses on the console either. Xbox 360 users won't be able to use party chat in certain online multiplayer playlists. Update: According to Co-Optimus member Tino, the Guardian review is actually incorrect. Spec-Ops is accessible without completing single player, but you'll have to unlock the missions as you progress through the cooperative mode. We've pinged PR to get clarification. Update 2: We've gotten multiple tips from people who managed to snag the game early thanks to broken street dates that the Guardian article is indeed wrong. Co-Op is available without completing the single player game first. Page created in 0.4335 seconds.